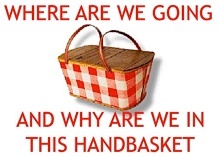 “Going to hell in a handbasket”, “going to hell in a handcart”, “going to hell in a handbag” are variations on an American allegorical locution of unclear origin, which describes a situation headed for disaster inescapably or precipitately. In September, I had lunch with my brother in Denver when I was in town for a conference. After some small talk, he launched into the political situation by asking me “So do you plan to vote for a crook or a liar?” And honestly, I didn’t know which candidate was which – they both qualified for either description. I will be clear – I voted for Hillary because she represented the status quo and I was OK with that. She was the more tolerant choice, the more progressive choice – the safer choice. When the election results were in, I felt stunned. How could this have happened? How did we elect someone who heretofore seemed to be a joke candidate? This has been a common refrain, given the pre-election polls and predictions. But it did happen. And now we are all in this basket together. I wish I felt like we were headed somewhere good, but my gut (and I have learned to trust it implicitly after 57 years) tells me otherwise. We are on the road to perdition, people. The highway to hell. The mainline to mayhem. And…we did this to ourselves. Anyone who can observe the actions of the past two weeks and use their critical thinking will see that the path ahead is going to be led by people with an agenda that is radically different than at any other time in America. A man with tight ties to white nationalism is leading the White House strategy, the future Secretary of Defense is a warmonger, the Attorney General selection has been quoted making racist remarks, and the proposed National Security Advisor is an Islamophobe. This paints a pretty clear picture of the future and it is grim. The morning after the election, the hallway in my building was being painted and all the overhead light fixtures had paper cones around them. It darkened the path and felt gloomy and dim. It matched my mood and the view I have of the future a little too well. The paper cones have since been removed, but walking down the hallway, I am reminded that we are headed for some dark times ahead. I’ve heard the reminders to be patient, he’s “not that bad”. I’ve been told to “wait and see.” But my gut (there it goes again, being all judgy) says “hell, no.” By waiting, I am part of the problem. I am accepting this future as a given. I can’t do that, people. I can’t. I have to say “look at the past to predict the future” and any leader with an untamed ego and a hair trigger temper will lead us to danger. Already, he’s showing his temperament over minor slights. He’s continuing to question the news sources and cast aspersions on their ability to report on his administration. This erosion of trust is step one in controlling the news. And by controlling the news to match the perceptions of his truth is step two in compromising the First Amendment. Who out there remembers Pravda? In Russian, Pravda means truth. It was the state owned news outlet following the Russian revolution and was in place for 80 years, until Glasnost came along, changing the Russian landscape. When I see this pattern, I worry. It can happen so gradually that people may not notice the change over time. Take a snapshot now and compare in 6 months – 12 months – and be mindful. When a government seeks to control the dialogue and conversation, truth suffers. Considering the scrutiny over our current president’s religious affiliations and the ongoing questioning about his faith, I have to say I am honestly perplexed. All of these things listed above are facts. They are known to be true and voters heard them. Still, the religious right said “He’s our guy”. And the Catholics came through, too. His stand on abortion alone was enough to sway them. And…if you recall, he used very graphic references regarding abortion in the last debate. Graphic and wrong. It was a scare tactic that somehow seemed to work. All the progress over the many years of educating people and now we are facing a complete reversal of thought, with abortions being considered a criminal act. We are at the top of the bobsled hill, people. We are about to start the one way trip down the slope with a guy at the helm who hasn’t even been on a sled before. I don’t feel safe and I don’t feel hopeful that we will all make it down the hill OK. We have a lot at stake here. And while the right approach for some may be to close your eyes and hope, and for others, it’s to sit up front and revel in the rush, I plan to be one of those who actively tries to slow the damn thing down and wrestle some sort of control back. I didn’t sign up for this ride. I don’t intend to be collateral damage along the way. This entry was posted in Anger, critical thinking, General Rambling, politics. Bookmark the permalink.